Well these days, it’s a rarity there isn’t a big tub of süzme yoghurt from the market in the fridge. We dollop it onto the side of most dishes, we mix it into meals, and we also whip up quick meze dishes with it. For this post, we’ve got a couple of quick yoghurt-based meze recipes for you, and, as with lots of others we’ve mentioned, these are perfect summer meze dishes for your barbecue. Yes, we know it’s not summer yet but we’ve had / are having a very mild winter. 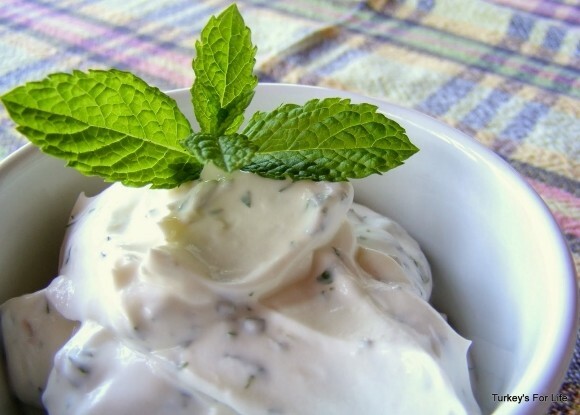 We’re enjoying outdoor eating and we’re going minty and spicy for these mezes. And if we’re doing a barbecue, we need a simple salad. This is one of ours (they vary), pre-dressing. That can be done at the last minute before the meat (or whatever else you’re cooking) is cooked. Fresh lemon wedges and olive oil at the ready for that one and it won’t look quite so organised once we’ve tossed it all together. As usual, quantities are haphazard here – it’s down to your own taste. Generally, if we’re doing a barbecue, we’ll roughly divide 500g of süzme yoghurt three ways: a third of it will remain plain and the other two thirds can be added to a bowl ready to make your two meze dishes. We’re going to be making a classic haydari meze – we challenge you to find a Turkish restaurant that doesn’t have haydari as part of its meze display. Haydari is just a fact of life in Turkey. And we’re also going to be making a chilli yoghurt. Now, this is just one of those dishes that is an essential for us. When we first came to Fethiye on holiday in 1998, we were taken to Cin Bal in Kayaköy by our new found friends. At the time, Cin Bal was nothing more than a shed with sheep hanging up – obviously, we wondered what the heck we’d come to and left all the ordering to them. This was one of the yoghurts that arrived – it was a first introduction to a world where yoghurt wasn’t over-sweetened strawberry flavour – and we just fell in love with it. We still order it to this day – and we make it for our own barbecues, too. Add two thirds of your yoghurt to a bowl. Crush or finely grate 1 large clove of garlic and add that to the yoghurt along with a small pinch of salt. Add the juice of half a fresh lemon. Now for the rich, smooth part – and this is optional. Add a small glug of olive oil and a dessert spoonful of mayonnaise (traditional haydari does’t have mayonnaise but this is a tip from a Turkish friend whose cooking we love). Give it all a good stir and do a taste test. Now divide your yoghurt mixture between two bowls. For the haydari, add a generous sprinkling of dried mint (some people add dill or purslane – we use whatever we’ve got in the house). 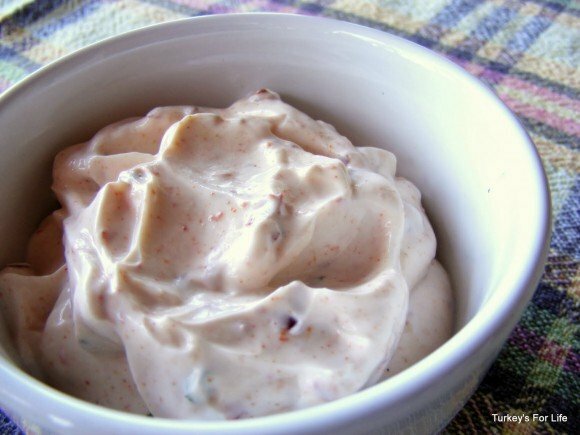 For the chilli yoghurt – simple – a good dousing of hot chilli powder and mix, mix, mix until your yoghurt turns pink. If you make this a while before, your yoghurt will take on more colour. Yes, I know they were free! We both had them. Amazing way to buy Suzme yoghurt. But we weren’t able to find them for the last couple of years. So easy. Can’t wait to wow someone when I produce these two!